While all hospitals must confront the limitations of wireless medical telemetry, looming capacity shortfalls are especially challenging for VA Medical Centers. This is due to strict Cybersecurity mandates, which will require WMTS networks to meet the FIPS 140-2 standard through integration of strong encryption. Such encryption will consume approximately 50% of the existing medical telemetry network capacity. 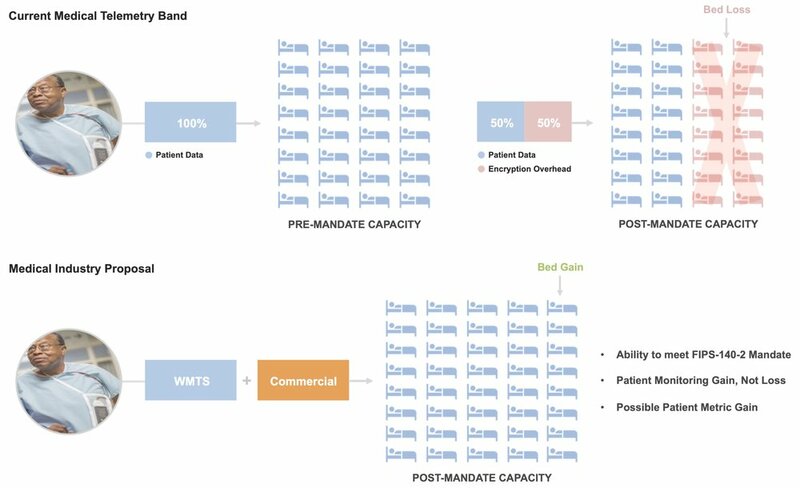 Without augmentation in the supply of WMTS radio spectrum resources, VA facilities will have to meaningfully reduce the number of patients they can monitor, and this will have unacceptable clinical consequences. WMTS systems used at VA hospitals will soon have to meet the FIPS 140-2 standard and include advanced data encryption. Absent commercial spectrum, WMTS does not provide sufficient bandwidth to accommodate such encryption without a 50% loss in bed monitoring capacity. For the Veterans Administration and other Federal hospital systems with Cybersecurity mandates, expanded capacity is essential to prevent patient monitoring loss. Commercial spectrum would prevent loss, while still adding incremental patient monitoring capacity at the VA.